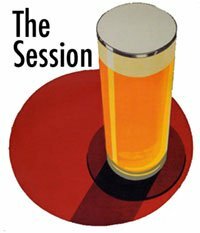 This month the session is all about growlers and is hosted on the Washington Beer Blog. In Ireland, a growler is a rare sight. I have heard that in Cork, the Bierhaus now has a growler service. In Dublin, the Bull and Castle was looking to get branded growlers and getting a refill service but there is no sign of them yet. My own growler is this 2L of Hopus that I got late last year. Part of the swingtop is a carry handle. After I drank all the hopus, I had nothing to put into it. Maybe some day I will get it filled with some beer but in the meantime I can always use it for bringing homebrew to meetings. John pretty much hits the nail on the head as to why we don't have much in the way of growlers in this country and that is probably because of public transport and our pub culture. In fact the only real use for a growler that I can see is for special beers that are rarely available. For instance it might be nice to go to one of the upcoming beer festivals and see if Barrelhead will fill my growler with their pale ale or one of the other breweries with specials that I am not likely to see till the next beer festival. This weekend I am planning on heading in to Dublin to visit the new Black Sheep pub, owned by the people behind Against the grain, Oslo etc. I will not be bringing my growler. So it's for preventing people who come to later to the festival from getting any of the rare beer? Isn't the beer in a growler really only good for 3-4 days? I do love the idea of growlers though. My workplace's head-office is in Wisocnsin, right next door to a micro-brewery (Rush River). They don't have a bar/shop, but will fill your growler for dirt cheap. What a great start to the weekend!